It's sometimes difficult to see quite where phone manufacturers are pitching their devices these days. It used to be clearer, with budget, mid-range and flagship but now we're getting devices coming along which challenge those boundaries and give exceptional value for money. Last week, I was writing about the Xiaomi Mi 8 Lite, which is right in the same category as this new offering from Motorola, the G7 Plus. It's priced at very nearly budget, behaves mostly like a mid-ranger but with some aspects which could be considered flagship territory. As we know, the G-series Moto devices have evolved now through a good number of changes and this one is the latest - and arguably - the best so far. This is, of course, what they consider top of the G-range, and is priced on release in the UK at £269. It doesn't have the 5000mAh battery of the G7 Power, but apart from that, leads the way. It's available in Deep Indigo and this gorgeous deep red which they call Viva. It's quite a tall device, a smidgeon taller but narrower than my Moto Z3 Play, but obviously thicker as it's not Mod-ready and the battery is locked in. It's of average weight, which is surprising when we learn that the front and back are Gorilla Glass 3, although the band holding them together is plastic. The front is flat but back curves away round to the then flat back. On the back is the now-signature camera ring cluster and underneath it an ever so slightly too small circular fingerprint scanner. On top is the SIM Card (dual in some markets)/microSD Card Tray and on the right, volume rocker and knurled power button, which you won't be needing much. More on that later. The bottom houses a speaker, 3.5mm audio-out socket and USB-C port. On the front there's a minimal chin, but just enough for the firm to print their name, and in the forehead, proximity sensor, ambience sensor and selfie camera. In the hand it feels great and almost exactly the same weight, size and footprint as the Nokia 8, which I happen to have here. There's no IP-rating here but the internals do have Nano-coating which make them splash/rain resistant. It was great to see that in the box Moto included a TPU which will work fine for 90% of people, I'm sure, but it's a bit thin and flimsy in truth. A better one for a fiver is a good idea, difficult as it might be to look a gift horse in the mouth! There's a USB-C to USB-C cable and QC4 27W TurboCharger, yes - you read that right! It's a terrific addition to the package and in my test, I can get the 3000mAh battery from near-flat to 100% in 56 minutes. It's quite amazing watching it fly. 60% notched up in 18 minutes here, 82% in 28 minutes, 92% in 38 minutes, 96% in 48 minutes. I wouldn't want to do that every time, for fear of knackering the battery long-term, but for emergency boosting and when the user can't (or forgets to) trickle charge overnight, it's great to have. Which brings us nicely to battery life and the bad-press that the device seems to have got in the hands of some reviewers out there. In my first three days I can report that the battery, though of course I'd rather have 4000mAh, is good enough (on my level playing-field of reviewing, testing and using devices over the years) for my average mixed use (employing adaptive battery and brightness) for 24 hours with 6 hours screen-on-time. I think that's OK and certainly, for me, gives little danger of not getting to bedtime. If you want to carry the 27W charger, however, it obviously gives options for the heavier-user. There's no Qi Charging at this price-point of course. The G7 Plus has a speaker top and bottom, working together with the system-wide Dolby Atmos to create an excellent sound. Comparing this here with the Razer phone, the Moto's top volume exceeds the Razer's by some margin, even if it doesn't quite get the richness and bass. The Razer's listening experience is superior with Dolby Atmos on, fuller and deeper, but certainly at the expense of volume. Depending on media source and, as always, music style or spoken word, the Moto, with volume wound right up can sound a little tinny, but drop it down to 80%, which is still very loud, and that quality comes back. Playing with the Dolby settings, which are Smart (auto), Music and Film, much like the arrangement on the top-end Samsung devices, sometimes it sounds better with, without - or a mixture of effects. All in all, though, it's an excellent facility and well worth having. The stereo effect, when placed 18" in front of my face testing with my usual stereo-exploitative track The Prophet's Song by Queen, is terrific and the fact that the bottom-firing speaker carries the low-end and the top (earpiece) speaker the highs, doesn't detract from the experience hardly at all. Further testing with YouTube videos designed to demonstrate stereo effect similarly sound terrific, though not creating the highs of the Razer's 5.1 surround. The G7 Plus has a 3.5mm audio-out socket (cue cheers). I plugged in my AKG K701 reference headphones and can report that the sound is terrific as well. It's rich and immersive, with the stereo space sounding great. Testing with 5.1 surround YouTube videos and Netflix, there is a real surround thing going on, with spaceships and helicopters coming over my shoulder sounding like they are! The audio purist will of course find better sound elsewhere with fancy DAC and amplification options, but at this price-point I think that 99% of people wouldn't think that the sound produced is anything less than excellent. Bluetooth 5 is on board with aptX too - it seems to hook up easily and quickly to bluetooth peripherals and sounds equally good though headphones or speakers. As if all this audio-chat was not enough, there's also an FM Radio present which fires up nicely on demand and initially needs something plugged into the 3.5mm socket to act as an aerial. Once done, the unit tunes in scanning for stations. In North Wales it found plenty of stations and many of them were strong signals which again, sounded great. Once established, you can then switch the sound to come from the speakers and there's even a record facility for those who want it. A great (and rare) addition for devices released, certainly in Europe. Whilst we're talking wireless, I'll just mention that the wifi and cellular aerials, as usual, it seems with Motorola, are excellent. Last week I was really struggling with the Pixel 3 with a voice call, but in the same situation, this was perfect. The 6.2" LTPS IPS LCD screen is a 1080p (FullHD+) one with a 19:9 ratio, making it tall and almost filling the frontage, as I said earlier. The resolution creates 405ppi, which is plenty for most human eyes! Unlike the Super AMOLED panel of the Z3 Play, the LCD here is clearly cheaper and uses less power, but actually it seems sharp, bright and colourful. You can adjust the colour in Settings between some basic parameters, but the Saturated setting looks best for my use. LCD panels have come a long way over the last few years and certainly Sony's XZ2 screen was hard to tell from an AMOLED. You clearly also get no burn-out and longer-term potential problems with this technology. I don't have any bright sunlight here to test the screen with, but although pretty overcast out there it seems very bright to me (the Cave Dweller!) and yes, it could be brighter, but remains perfectly usable. If I get some sun, I'll report back! The elephant in the room now - the notch! Yes, there is one, and it's a kind of large teardrop one in the middle. It is quite big, and for those who don't want it at all, there's no way in software to hide it with a black block for the 'ears'. So it'll be a question of whether or not people can get used to it. I have quickly adapted, and I think like most objective users out there will report, the brain very soon adapts and doesn't 'see' it. If you have black wallpaper of course you can't see it on the homescreen! There's another bonus for users at this price-point, that being OIS in the rear-facing 16 MP f/1.7 camera. This obviously helps with low-light shots and as you probably know, I'm no pixel-peeper, but those who are say that the phone can take very good low light shots with little noise, compared to units without. No doubt Steve Litchfield will put the camera through its paces, but to have OIS is a real bonus for those folk out there who like to take photos of owls! It's twinned with a 5MP f2.2 depth-sensor unit and between them, they seem to do a decent job of the en vogue Portrait thing. The front-facing Selfie is a 12MP one. Comparing the camera's options to the Z3 Play, there's a couple more 'toys' on the Play (Text Scanner, Face Filters) but on the Plus, there's better slow-motion options. The camera setup on the newer model is better equipped in terms of raw MP counts and the specs slightly evolved, like for example, the addition of 4K video from the Selfie at 30fps, the older stuck at 1080p. There's an additional 'all in focus' switch which, presumably, works with what hardware and software there is to emulate in 'real' camera terms what would be a very small aperture opening. I guess that the clever bit then comes in with OIS and balanced shutter-speed to try hard to not create a load of noise. The rest of it though seems very similar indeed. At the risk of repeating myself again and again, here's the short version - most people won't care as long as they can take snaps! We'll move into software in a minute, but just to mention that the fingerprint scanner with a big M in it on the back is very responsive, accurate, quick and easy to set up (though not quite Pixel-quick) and just in the right place. Because of the available options supplied by Motorola, there's loads of ways of interacting with the phone and not having to always pick it up and use the fingerprint scanner to get in - though as I'll say in a minute, there's room for improvement in software. Firstly, the very same 'approach' is employed that's present in the Z3 Play. Wave your hand over the sensor on the front of the screen and you get the Moto Circle with time, battery state, day, month and date. Below it, you also get Notifications, which are interactive with the option to quick-reply on-the-fly. Long-press one of them and slide down to dismiss or slide up to open it up. This is where it gets clever as face-unlock is also employed in the Moto Actions app, so that if you're looking at the screen it will then bypass any lock you have on the screen which would usually make the user press the fingerprint scanner, put in code/pattern or whatever. This system gets you straight in and working. 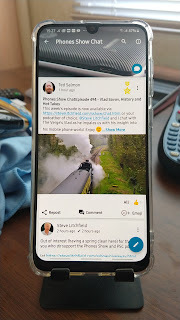 The display is not as bright as the one on the Z3 Play, presumably that's an LCD thing, but it's not far off - and great to have on an LCD screen at all. Once you're in, the software experience is very close to Vanilla Android. 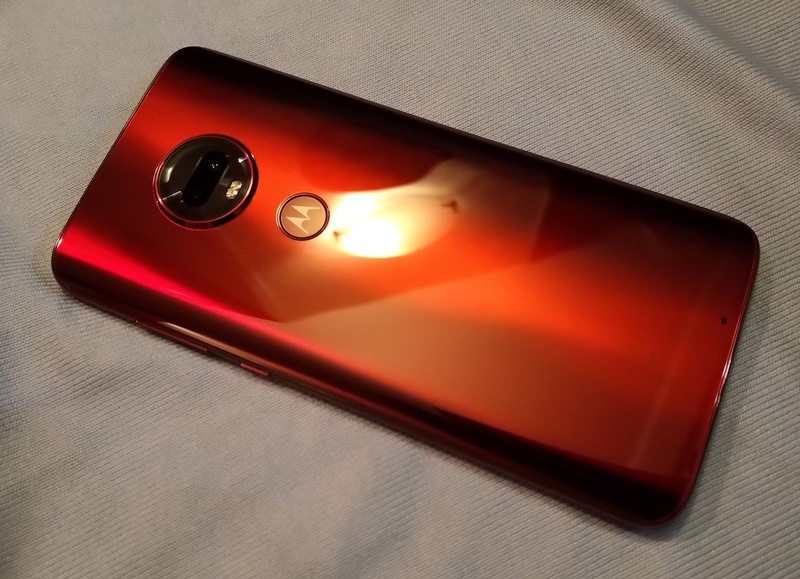 Motorola have been good at this over the years - adding virtually nothing to the Stock experience except for a few things which put their mark on the phone - and mostly those options are useful ones, not bloat. There are also adopted enhancements from Android Pie, some good, some bad. Firstly, out of the box you get the Google Feed by right-swipe. Not a given these days with Bixby this and Xiaomi that! You can have the traditional 3 buttons at the foot of the screen if you like, but far better is the 'long pill' - present on the Z3 Play but not so Pie-adjusted (yet). It's a bar that sits at the bottom, longer than Pixel's, which you swipe left for back, tap for home, flick right to switch between last two apps, long press for the Assistant and swipe up on for recents cards in a carousel. Perfect. Everyone should do it this way and Google should adopt it for Android Q. The context-sensitive back button is just not needed. You can swipe up from anywhere on the homescreen for the Apps Drawer and down from anywhere for the Notifications Tray. In the Moto App, you get access to all sorts of Moto Actions like options to work with the off-display as mentioned earlier, lift to unlock, karate chop for flash, twist twice to fire up the camera, three-fingers on the screen from anywhere to take a screenshot (and then edit or extend-down), turn the phone over to invoke DND, attentive display, which keeps the screen awake when it detects you looking at it, music controls using the volume rocker if the screen is off, face unlock itself - we've seen it done before but it works well here too. The only caveat seems to be that (apart from the above-described dealing with incoming Notifications) if you're using a screen lock (so, most people) for some reason you also have to swipe the screen up (after you've been recognised) to get to the homescreen, which means that you might as well by then put your finger on the fingerprint scanner on the back anyway. Not sure why that step is needed and can only assume that they'll remove it in time. Seems completely pointless. Much of the settings menus follow stock Android too, with the option to use a 'dark' theme, for example, only working in some places, where Google have flipped a switch server-side in apps like Contacts, Messages, Clock, phone, but not across the UI like others have been now doing with some consistency - or at least including the option to do so. So for now, there's still lots of white around, but they'll get there eventually, I have no doubt, even if it has to wait for Q. Digital Wellbeing is present and correct along with instant greyscale, which is very handy, and Night Light for toning down colours to rest eyes. There are somethings missing, like a battery percentage in the Notifications Tray (without a down-swipe) which is legible, not tiny and inside the icon, homescreen layout is stuck on 4x5 or 5x5 which really isn't flexible enough when some widgets just don't fit - and to make them fit, the font and/or display size has to be changed to settings that really then make it impossible for other display use. You guessed it, enter Nova Launcher! I usually end up here - though to be fair, I haven't needed to with the Z3 Play. Maybe when Pie arrives on that, the same will be needed. Thankfully there's the Nova Companion App which enables the Google Feed to be present, so workarounds meet the need. Anyway, there it is. I've been able to compare the G7 Plus with the Z3 Play to a degree here, though with the latter still stuck on 8.1, it's a bit awkward to level that out. At the end of the day, this is a terrific smartphone for the money and 95% of users would be very happy with the performance and features. Some will be bowled over by the OIS if they're into photography in a big way, audio fans will appreciate the excellent speakers and headphones output whilst others will love the near-Vanilla software experience and very smart off-screen options via (what they are now calling) Peek. For me, that makes a huge difference and to a large degree offsets the annoyance of having the fingerprint scanner on the back, for cradle, car or desk use. The question is also about Mods. I love my battery and speakers Mods, so it will be difficult to wrench me away from that. I accept that the sound coming out the newer phone is much, much better than the Z3 Play's, but even so, being able to slap on a JBL speaker remains special and rewarding - not to mention making it sound, in turn, better by far than even this newcomer's sound. As for power, yes, it's got that great charger, but I'm concerned about the juice gobbling with all these fancy tools turned on. I know it seems to be good for 24 hours in initial testing, but there's nothing like the reassurance of a bag full of battery Mods! I'll be keen to see how the 3000mAh battery performs over a week or two. We try to avoid reviewing phones on the basis of 'for the price' and this time, it's a bit simpler - because this phone punches above its weight on several points, so we can clearly say that this phone is worth much more than the asking price. It's pitched in amongst competition, of course, especially from Xiaomi, Honor and others at this price-point - and it deserves to do well, hold its head up and be counted. A terrific phone - and a drop-dead gorgeous colour! Recommended highly. Thanks Steve - yes, me too! Great review Ted. We all love that colour! This one seems to cover all the bases for me. Perhaps it's worthwhile trying to find an international model in the USA. Thanks for the useful review, Ted!